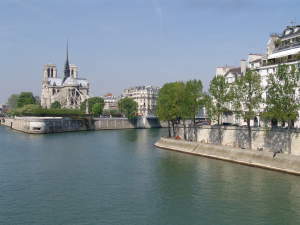 Pont Marie (line 7), 2 minutes & Saint Paul (line 1), 4 minutes walking distance. 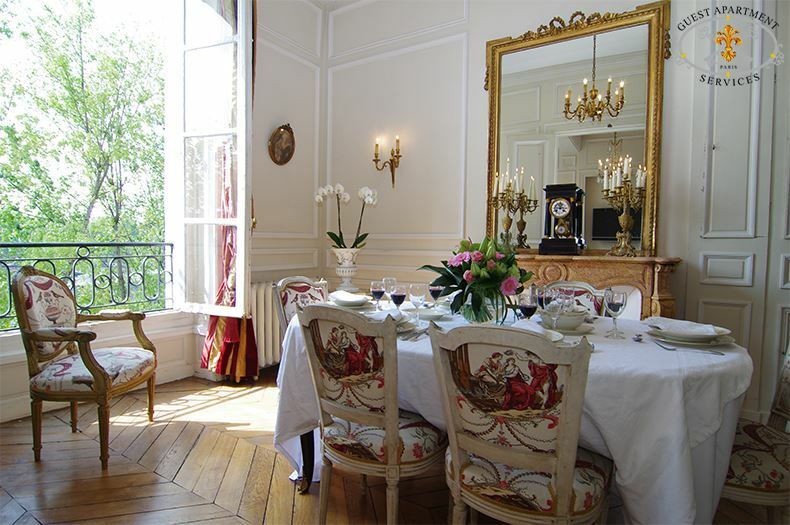 Situated on Ile Saint Louis, surrounded by the Seine River,these exclusive newly renovated combination Paris apartment rentals are located along the river, a prestigious address, ideal and central, within a 3-minute walk from Notre Dame Cathedral. 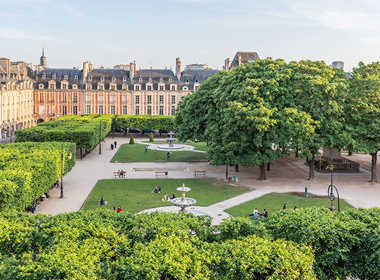 In the neighbourhood of Ile Saint Louis, with its own Village spirit, you will find a variety of restaurants, art galleries, fine shops, groceries, mini markets and all the convenience of a post office, pharmacy, and many other services. 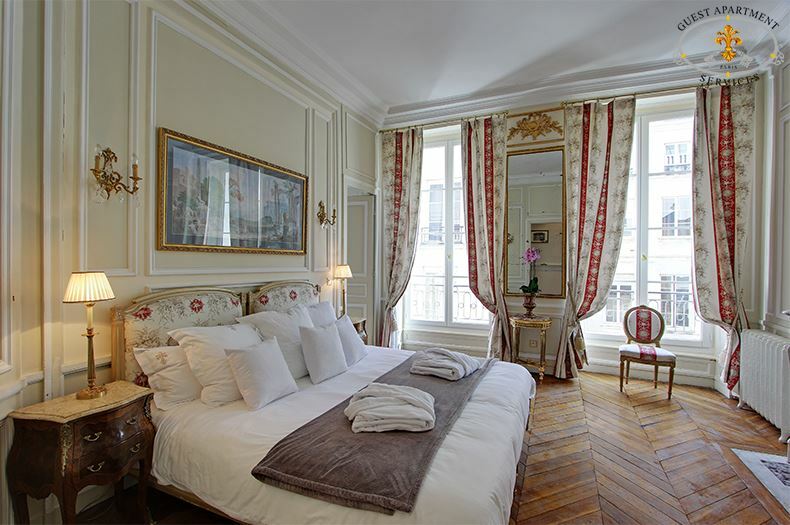 Also within walking distance of attractions such as the Pompidou Centre, the Louvre, the Left Bank, the Right Bank and the Latin Quarter. 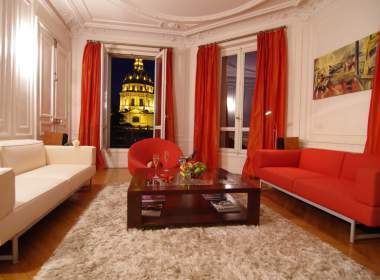 This modern designed luxury apartment overlooks the right bank of the Seine. 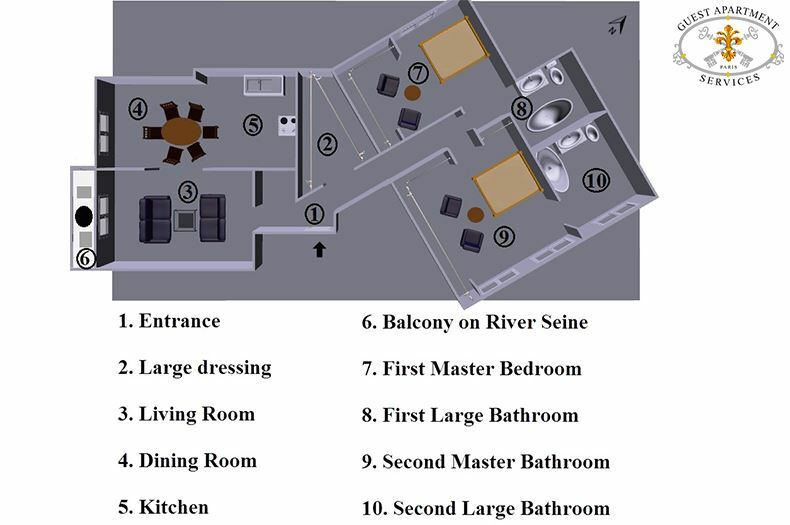 The building in which your apartment is located is a "Hôtel particulier," or noble townhouse which used to be the home of noble families in the 17th-18th centuries. 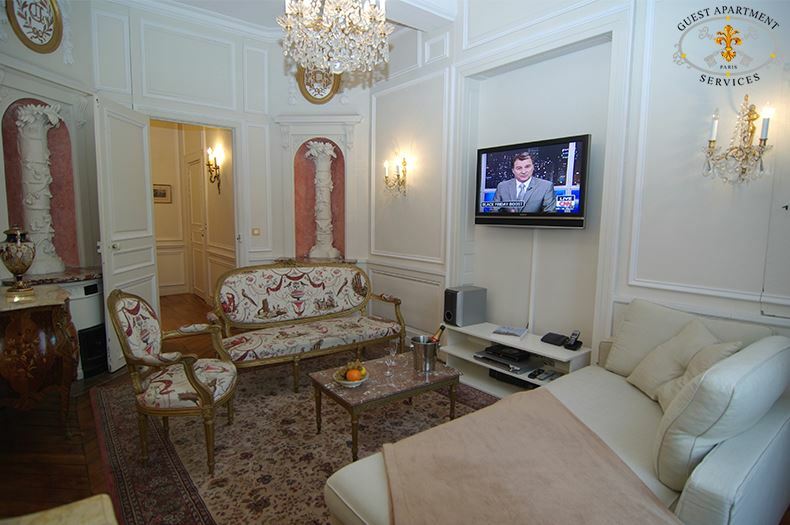 This apartment subtly combines this historical aspect with all the most modern amenities of today. 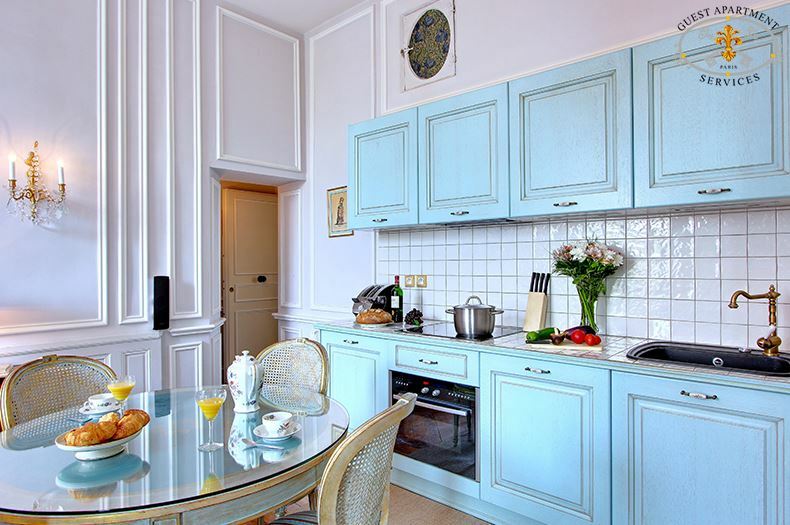 This combination will assure you of wonderful vacation in these completely renovated rental properties. 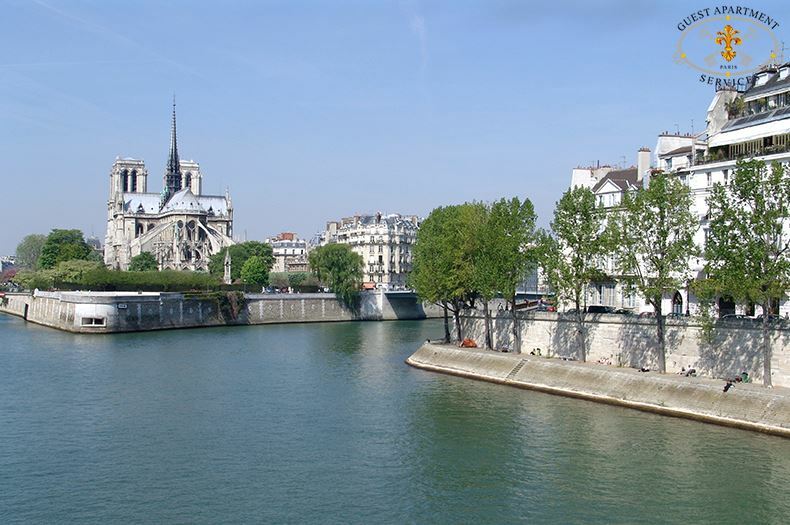 Through a small courtyard and up two flights of stairs in a spiral you will go to this apartment with stunning views on the river, the Left Bank, Ile de la Cité and Notre Dame Cathedral. The foyer of the apartment, while small, is welcoming. To the left you will find the salon. High ceilings and tall windows fill this room with a generous south-westerly light. The warm colors of paint and coordinated fabrics highlight the different architectural elements and objects. Crystal chandelier and sconces cast soft light on the 18th century furnishings. 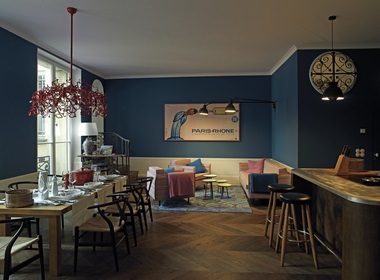 Antique prussian stoves grace deep alcoves in two corners. The pipes are cleverly fashioned to look like palm trees and befit the 18th century fascination with exotic locales and motifs. A couch, two arm chairs and a coffee table create a conversation area in the center of this luxurious setting. At the same time, a home entertainment center with large flat screen, DVD and surround sound make this your media room as well. 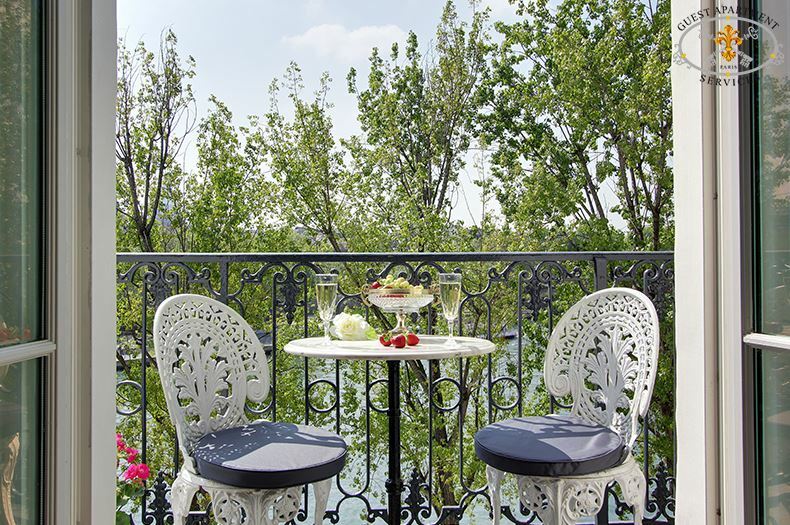 In case you prefer the view of the sunsetting over Notre Dame, the window provides access to a private balcony overlooking the Seine river. Through a large doorway is the dining room and kitchen. Again generous light fills this room as well. 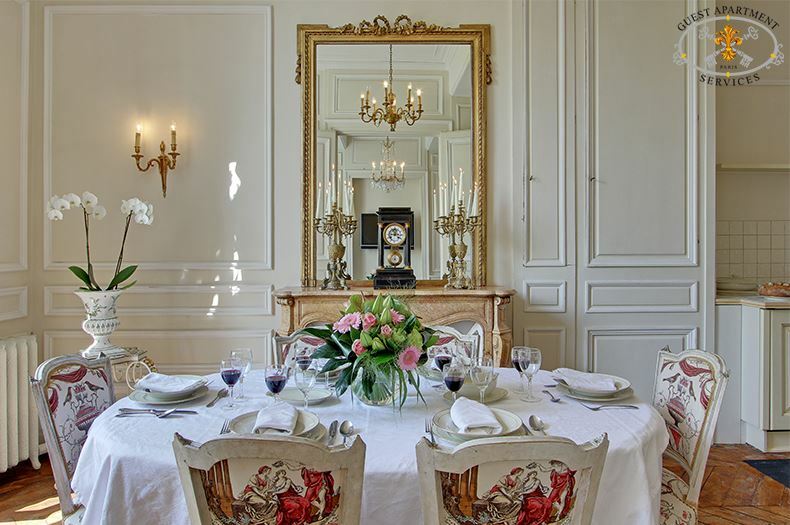 Centered under a dutch style brass chandelier is a Louis XVI style inlaid table that will seat 8 persons with ease. 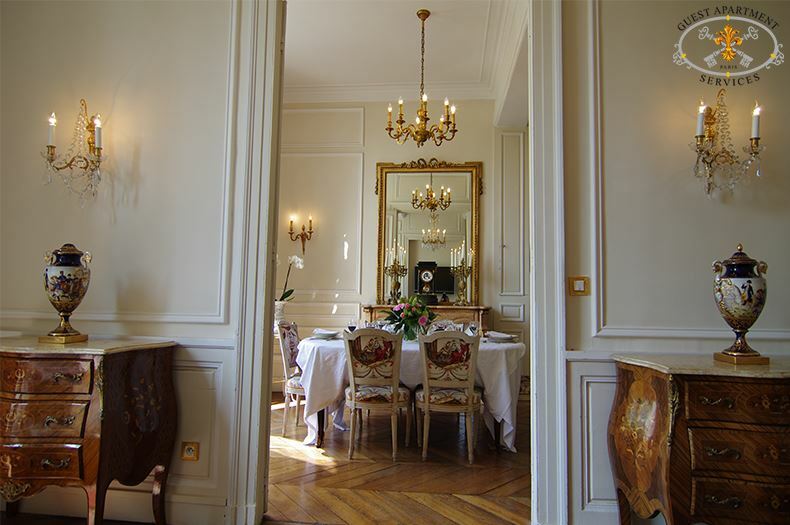 A pale orange veined marble fireplace is located directly behind the dining table. The tall window gives access to the same private balcony as the other in the salon. Opposite this is a large, fully equipped siemens kitchen. The cabinetry is painted to coordinate with the dining room and appliances such and refridgerator, dish washer and washing machine/dryer are hidden behind matching doors. Should you wish to stay in and practice creating haute cuisine, you will find everything here for your serious cooking needs. Back through that foyer and down a corridor you pass by a very large walk in closet for luggage storage. The first door to the right leads to a bedroom on the quiet court yard side of the building. 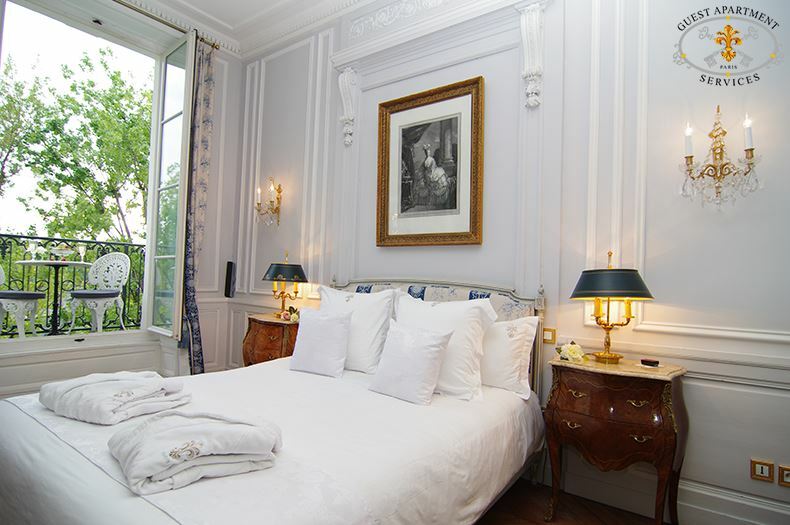 Two Louis XVI style twin bed can be reconfigured to create one large bed ( King size bed). 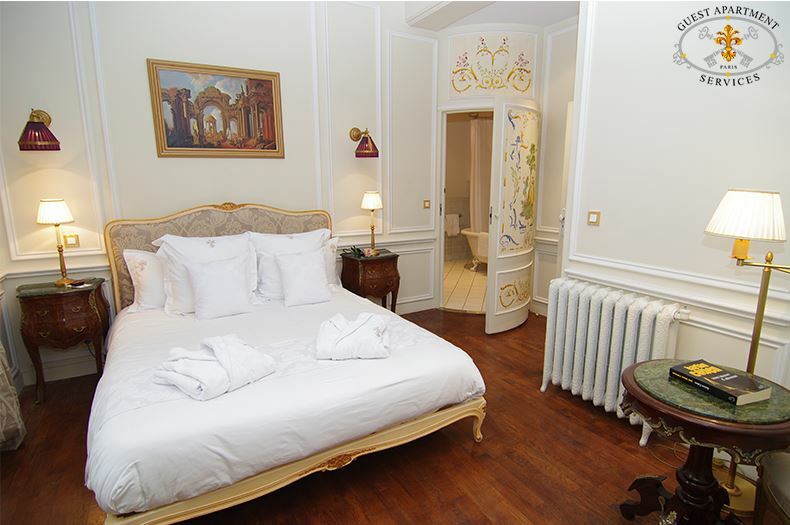 Night stands are located to each side of these beds. 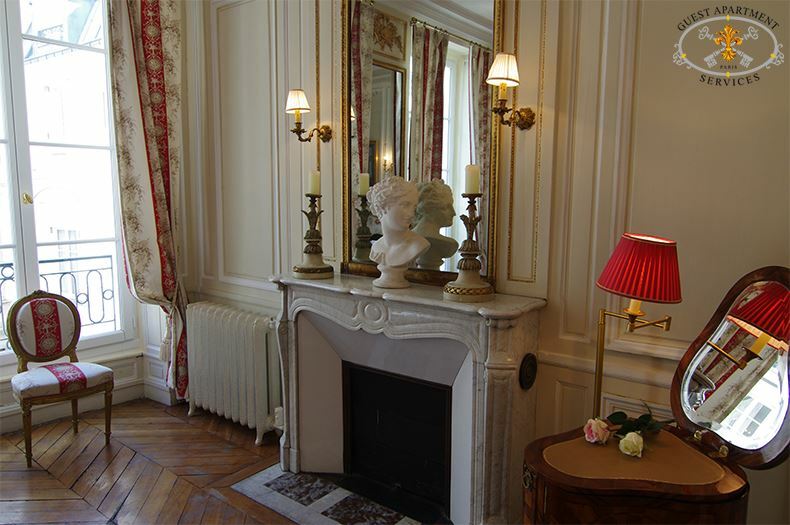 On the opposite wall is a white marble fireplace with tall antique mirror mounted above. An antique dressing table is situated nearby. The toile fabrics are cheerful and the mood set in this room is light and peaceful. A doorway leads into a large full bathroom of which the most striking features are the claw-foot tub with shower another fireplace. Continuing down the hallway to the end you will find the master suite of the apartment. This room is a cozy combination of neutral and warm colors. 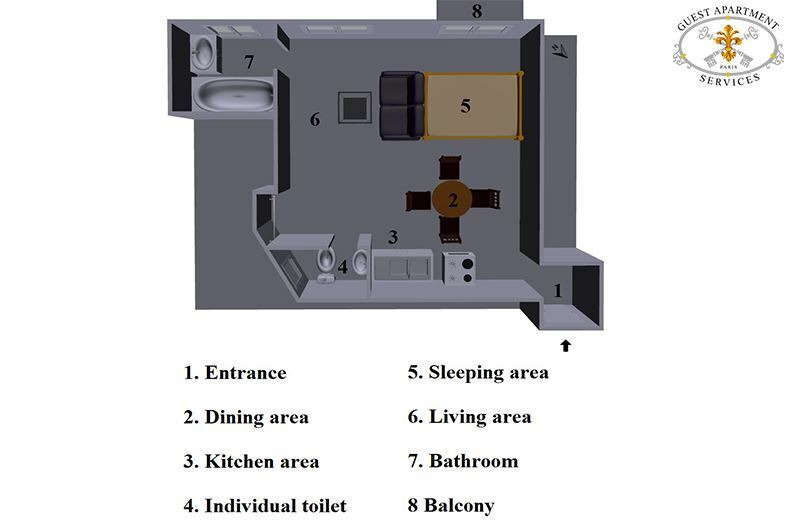 A large queen size bed with padded head-board is centered on the wall opposite a second home entertainment system. The walls are hidden behind deep, built-in closets. 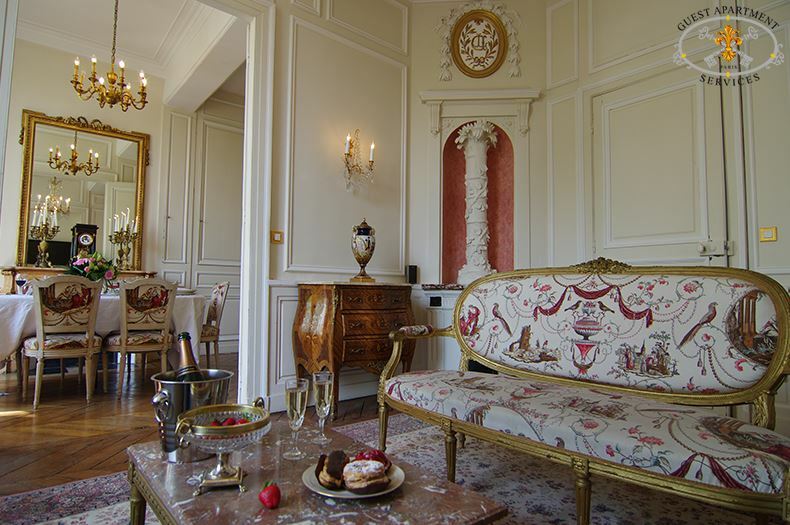 Low seated armchairs add to the comfort and boudoir feel of this room. In one corner is a curious convex door painted in 18th century style chinoiserie motifs. 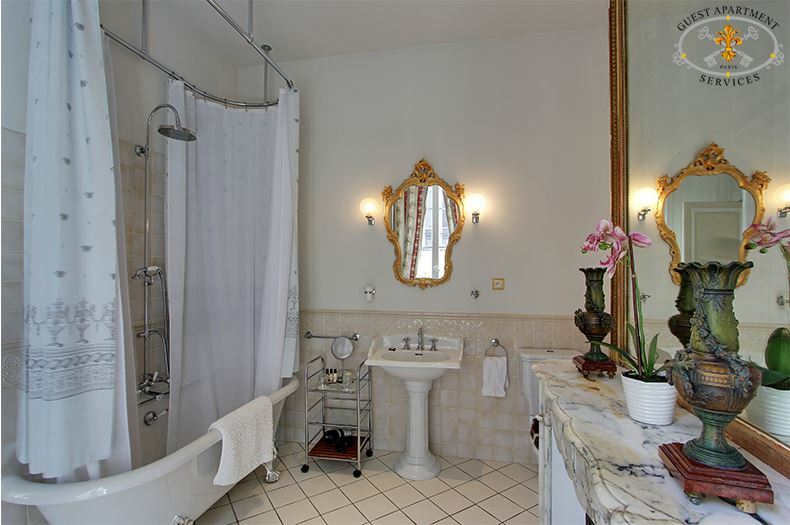 Opening this you will find the master bathroom complete with another exceptional claw-foot tub and shower. 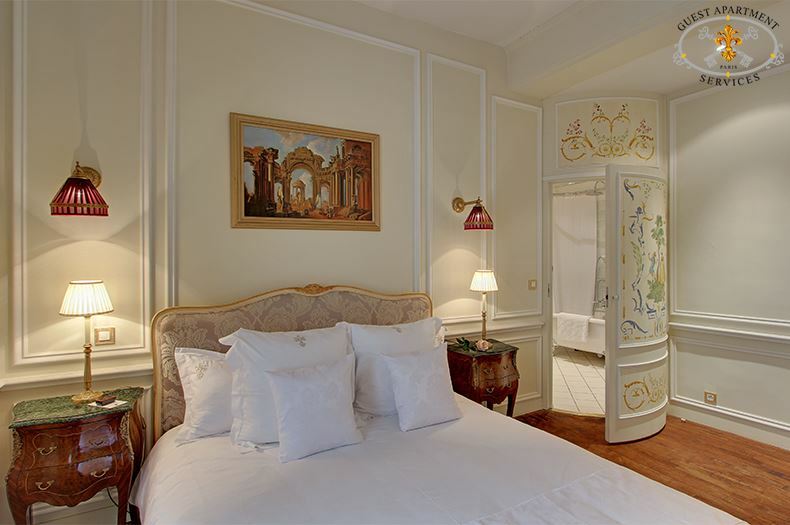 Pale green ceramic tiles surround the room and have a delicate raised enterlacing motif. 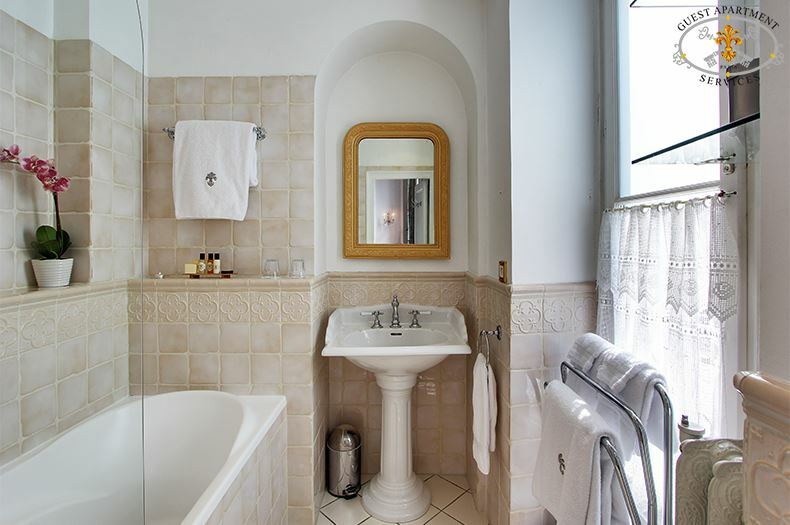 The pleasant nature of the bathroom is an invitation to a long soak in the tub whether you are tired or not. A strong box to store your valuable is available. The building is equipped with an intercom device, for your security and privacy. Landlady is present. 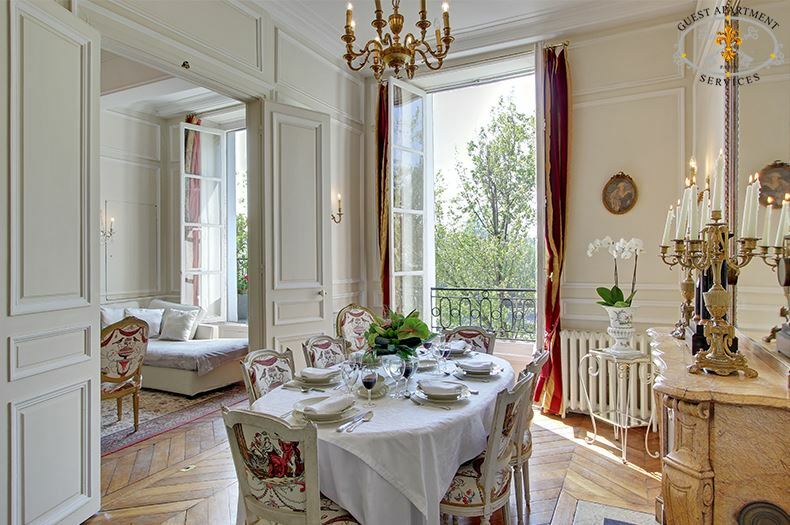 This exceptional Deluxe Large apartment has been entirely renovated. 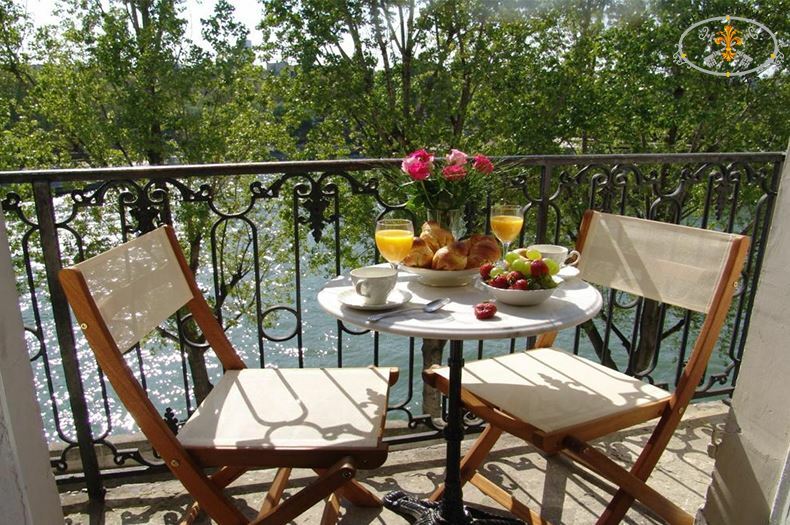 It offers a two bedrooms and a rare view of the river and the city. 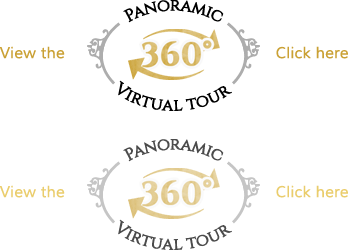 The 18th century style has been preserved and yet enhanced with everything you should expect to find in a luxury home today. The beauty of le style français is captured here. 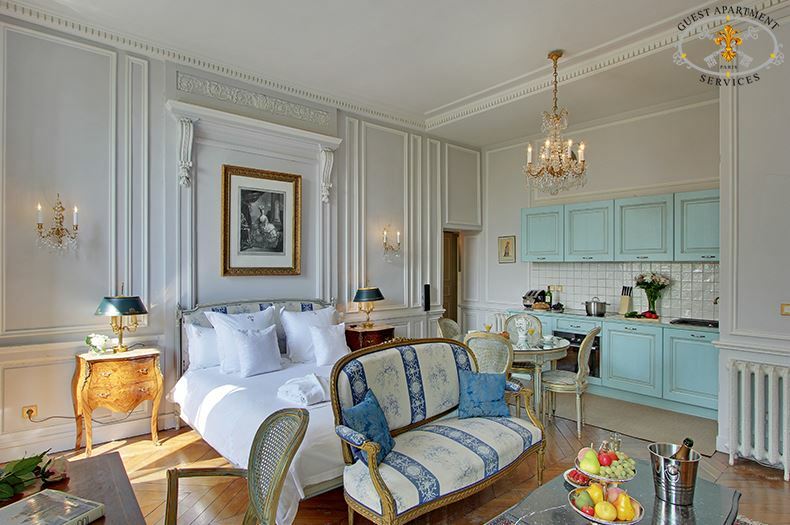 A parisian holiday in this apartment is assured to be filled with magic moments to be remembered fondly for years to come. 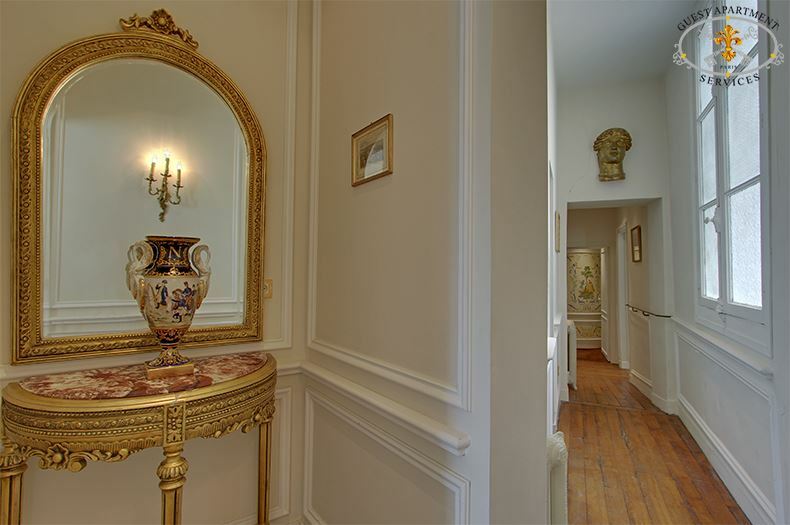 Prestigious address on the much-sought-after Isle Saint-Louis. This Paris apartment offers exquisite views of the river Seine, Notre-Dame and Paris monuments, from private balcony. 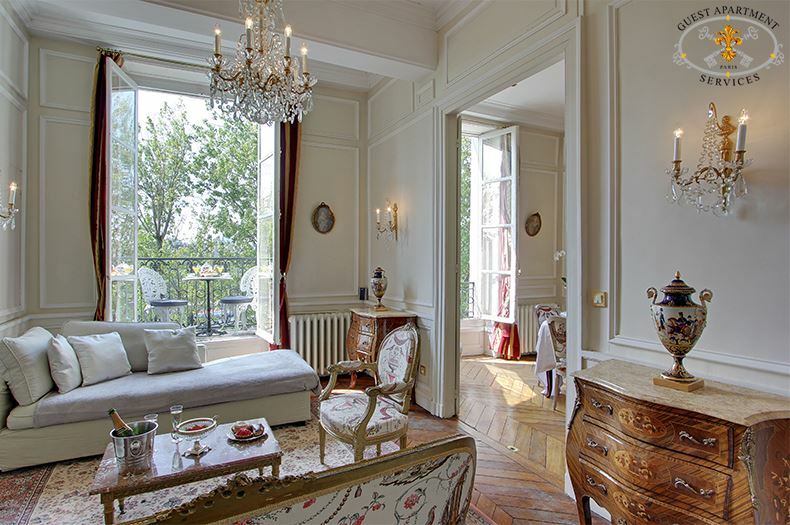 Elegantly appointed with high ceilings and floor-to-ceiling French windows overlooking the Seine. 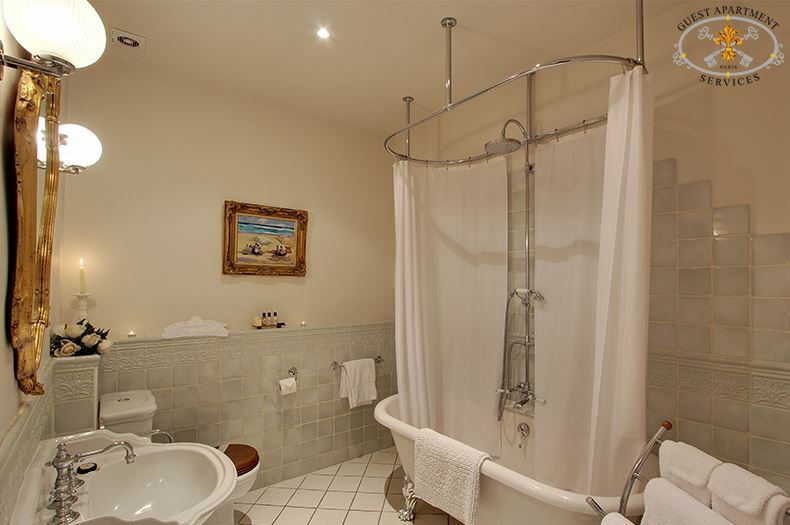 Two large windows, bathroom with tub and shower and separate water closet, this cozy apartment has much Natural Light all day. 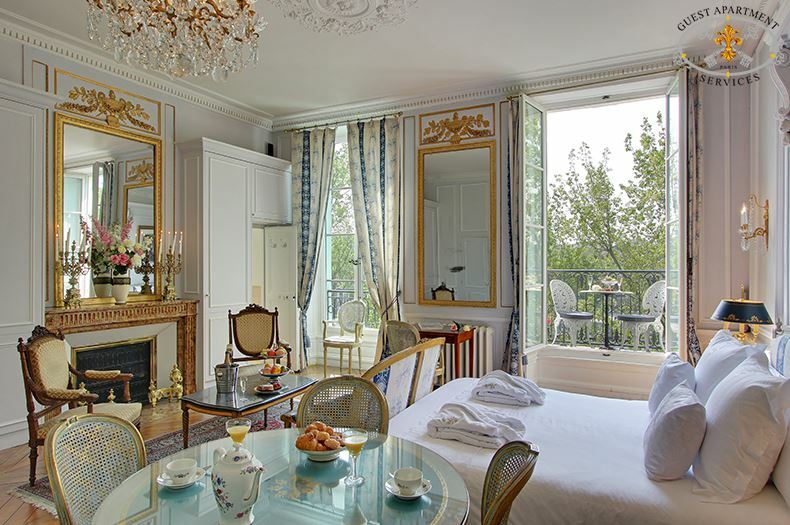 Framed with elegant toile curtains, one of the floor to ceiling windows gives access to the balcony. 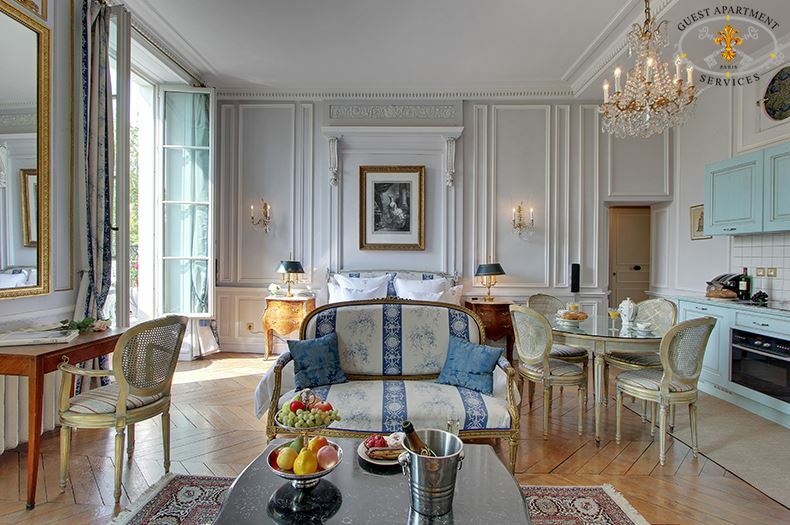 The living area consists of a Louis XVI style sofa and two arm chairs, gilded antiques, large gilded mirrors and a marble fireplace, crystal chandeliers, crystal sconces, large wardrobe with hangers and drawers. 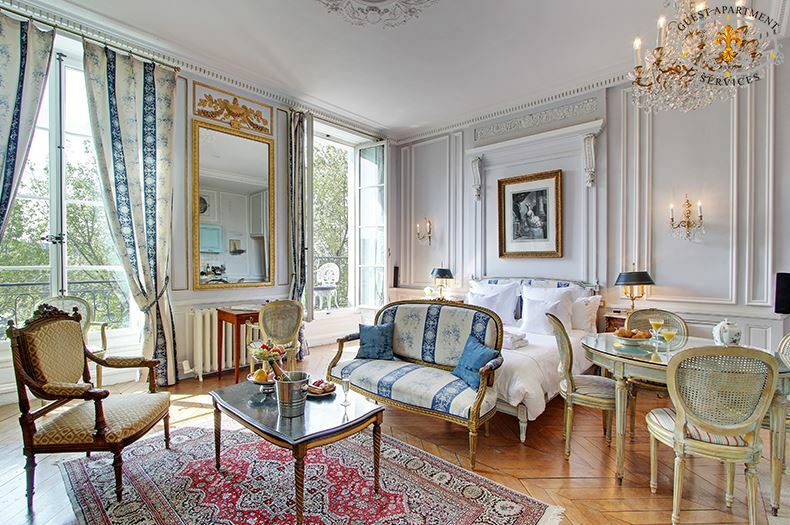 Several 19th engravings underline the traditional french style of the apartment, and selected decoration pieces are added to create a luxurious ambiance. Cable on digital Sony flat screen TVwhich is hidden from view in a built-in armoir, the TV offers the main international channels such as CNN, BBC…, anew DVD player, stereo sound system with CD player, private telephone and answering machine. Easy access High Speed Internet connection. 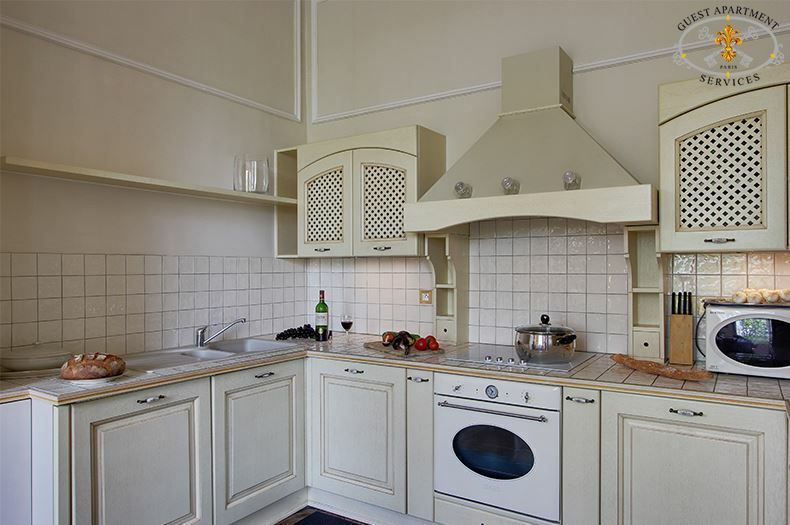 A brand new kitchen fully equipped with Siemens appliances, with fridge, freezer, electrical cooker and oven, coffee maker, toaster, electrical kettle, washing machine and dryer unit, ironing board and iron, ample storage and all necessary cutlery, glassware and crockery. 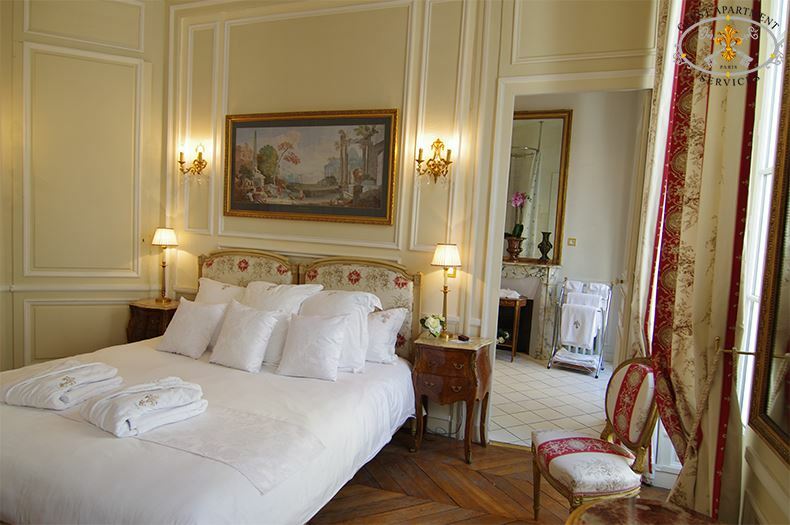 The queen size bed faces the fireplace, there are two bedside tables and crystal wall sconces. 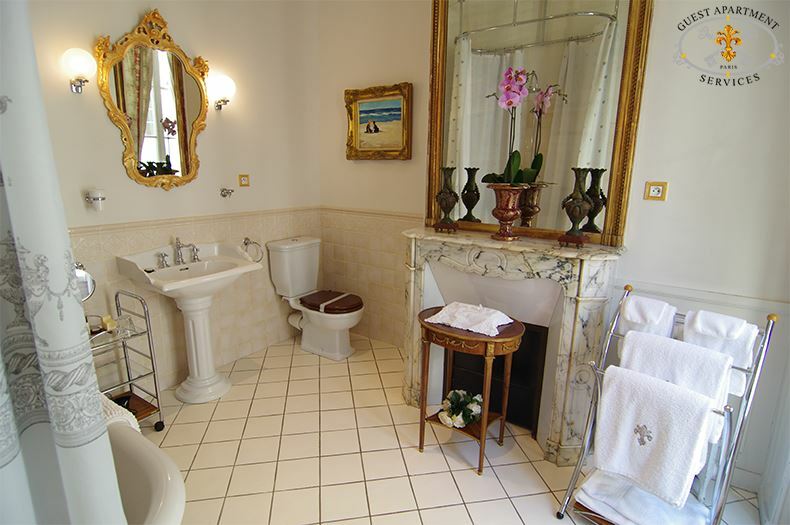 Separate bathroom with bathtub and shower, washbasin, lit mirror, hairdryer available. There is a separate WC. Safety box to store your valuables at your disposal. WIFI internet installed with access to unlimited free connection. The building is equipped with an intercom device, for your security and privacy. Custodian residency.